The best pool tables are fun to use and last a long time. They are endless entertainment for the whole family, and they spice up your playroom, basement or man cave. That's why our reviewers did the research to help you find the best pool tables for home use, and more! The result is this top ten list below. There’s something here for everyone. Before we get started with the reviews, here’s what you need to look for as you shop. Playing Surface: Quality pool tables have been made of materials like slate and laminates since back in the 1800’s. These materials are selected to help keep the playing surface level. It’s important to know what you’re playing with for those reasons. 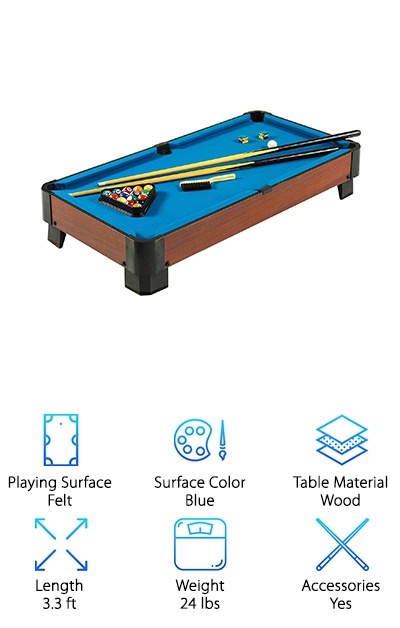 Surface Color: The pool table will be a new piece of furniture in your home, office, or business, so we’ve noted the surface color of the table here. You’ll be able to tell if a red table or a green table will look best. 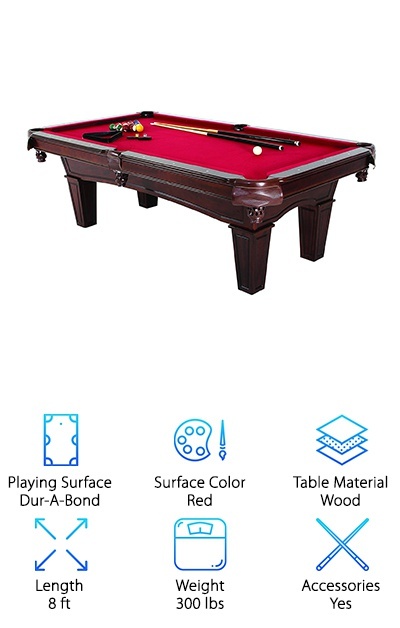 Table Material: Whether you play pool as a hobby or a professional enthusiast, buying your own table is a serious purchase. Many are made of wood, while others include weatherproof materials so that the game can be played outdoors. Length: One thing you have to be sure of before buying good pool table brands is that it will fit in your house! You need space for the table, and plenty of space around it to play. We’ve indicated length here. Weight: Certain pool tables will require some construction and are too heavy to manage alone. Take a glance here to check the total weight of the pool table you're interested in, and prep for its imminent arrival. We’ll mark the weight in pounds! Includes Accessories: You may need to purchase things like balls, your triangle, brush and chalk separately. If we’ve noted here that accessories are included, then you can read on to see the additional buying time you’re saving. That’s a great deal! Now that you know everything you need to look for when selecting a great pool table, it’s time to get to the reviews. Here’s the deal: If you’re in a hurry, take a look at our top pick and our budget pick. Both are a lot of fun and will bring you endless enjoyment. Right below, you'll find all runner-ups in our pool table reviews. 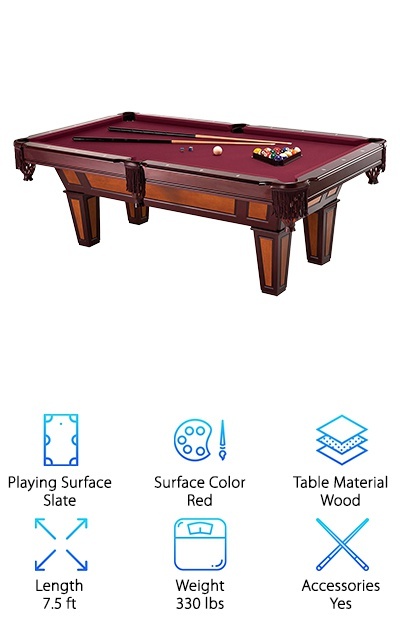 If you're looking for the best pool table available, it's on this list! Let's get started! Our top pick for the best pool tables in the world is the Mizerak Donovan II. This pool table is a thing of beauty. Here’s the scoop: It boasts a sleek design, with a wooden frame and solid slate for playing. Slate is the most popular choice for pool tables because it will not warp over time, and can be polished into the perfect level playing surface. Most professional players look for slate as well. Additional design elements include the chrome accents. There are chrome disk-style leg levelers at the bottom of each of the table’s four legs to also keep things even. This table is covered with a brilliant wool-blend red cloth. Once assembled with the slate, it will weigh over 800 pounds. It will measure 8 feet long, so make sure you’ve got the perfect space picked out for a game or two. 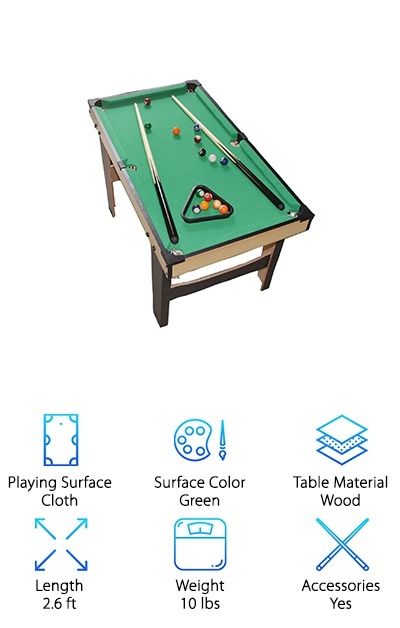 Finally, you get all necessary accessories with this table: 2 cues, billiard balls, triangle, brush, and chalk. If you have kids who have suddenly taken an interest in pool, or friends who love a casual game now and then, you’ve got to take a look at our budget pick. Purchasing the Hathaway Table Top is an affordable alternative to a professional-size pool table. It’s over three feet long, and 7 inches high once assembled. It will perch perfectly on the table of your choice. We selected the Hathaway because it still features quality workmanship. The table is covered with blue felt, and the body is made from wood. The legs are L-shaped and include pads to protect either the floor or the table it’s sitting on. Just like a full-size pool table, this one has netted pockets. Very little assembly is required – just the legs need to be attached. It gets better! The necessary accessories are also included. You’ll get two lightweight 36-inch cues, a set of billiard balls, a triangle, 2 pieces of chalk and a brush. The game of billiards has been around, literally, for hundreds of years. It’s believed to have evolved from a lawn game like croquet during the 15th century in northern Europe. Connect with your world history with the Triumph Santa Fe. The design will make you feel like you've truly stepped back in time. This is a wooden table, with traditional pocket décor and claw feet. Those feet include leg-levelers so you can even the playing surface if necessary. You'll play on classic green felt. The color compliments nearly every room in your house or office. This table requires some assembly and will weigh nearly 200 pounds when fully constructed. It measures almost 7 ½ feet in length, and just over 4 feet in width. But here's the kicker: a separate accessory purchase isn't needed! You'll also get 2 billiard cues, a set of balls and a triangle, chalk, and a plastic brush. Get ready to play with the Triumph Santa Fe! There aren’t too many games out there that have been played by kings, presidents, and hustlers, but pool is one of them. Our pool tables review includes selections even royalty would love, like the Fat Cat Frisco. This table is a beautiful work of art. It is a wood table, with braided accents and a maple finish. Wood construction can often minimize vibrations, helping the focused player. The legs are beveled, and the drop pockets are done in the French style. The felt on top is a warm hazel color, to compliment the wood. This is crazy: the table includes a 1-inch slate playing surface. Slate is the choice of the experts for billiards. The general recommendation is that the slate is at least ¾-inch thick, so you’re in excellent hands here. That Accuslate playing piece comes with its own 7-year warranty! Now, that's a good deal. Accessories are also included, with 2 cues, balls, a triangle, and chalk. When it comes to the right kind of pool table, you don’t want to scratch. That’s why you need to check out the Minnesota Fats Fullerton Billiard setup! Take a look: This table has wood legs and the top is wood veneer with a chestnut finish. The felt on top is a professional-quality wool blend in a vibrant red hue. The pockets are embossed synthetic leather, dark brown in color. This table will stand out in any room. Once assembled, it weighs around 300 pounds and stretches 8 feet long. What you’re really wondering about, though, is the playing surface. This table comes with the Dur-A-Bond playbed with an internal leveling system, preventing tilt. 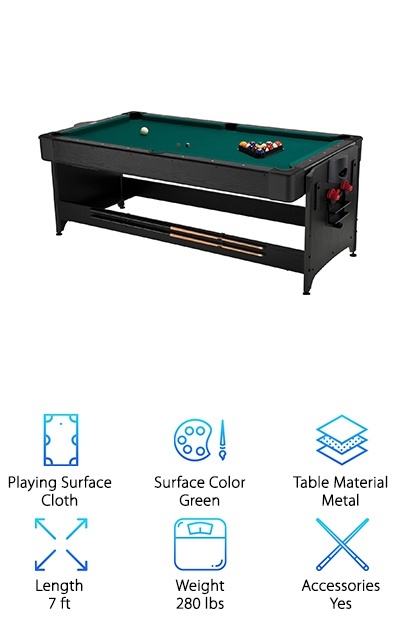 Become the most popular person in the neighborhood when you install your very own pool table in the basement or your man cave. Perfect your bank shot in your own living room, because this table comes with cues, a ball set, triangle, brush, and chalk. In its early days, billiards was actually regarded as a sinful game. Even kings and queens had to be secretive about their pool habit. Now, of course, there’s nothing forbidden about a good game at the pool table. Unless you’re trying to hide the secret strategy for your trick shot! Check out the Fat Cat Trueshot playing table. This product is proof you don’t need to purchase a much more bulky setting for your game. This is a metal table with folding legs, so it’s both portable and sturdy at 128 pounds. The longest side stretches 6 feet. The black metal, combined with the black cloth on top, means this table will blend in with both modern and traditional furnishings. It might even make you one of the “cool kids.” You’ll be even cooler if you master the game, so the included accessories are a nice bonus. You get the ball set, triangle, brush, chalk, and two cues. Pool is a social sport. Modern pool tables for sale bring people together for an old-fashioned game that has always stayed in style. Speaking of old-fashioned, a little nostalgia never hurt anyone. That’s why the design of the Fat Cat Kansas billiards table is so popular. Picture this: Ebony wood, with ball and eagle claw legs, topped with evergreen wool-blend cloth. The table stands 2.5 feet tall and measures 7 feet in length. This is a classic look for the classic player. Even the ivory-tone sight markings placed all along the table rails are elegant. While looks are great, you’re also looking for an even, long-lasting playing surface. GLD Products builds this table with hard tac covered with a laminate membrane for even-keeled competition. Set it up and take out the included pair of hardwood cues, rail brush, billiard balls, triangle and performance chalk. You and your new acquisition will be the talk of the town. Before you throw an epic party or have the guys over for a beer, pick up something that will impress just about anyone. 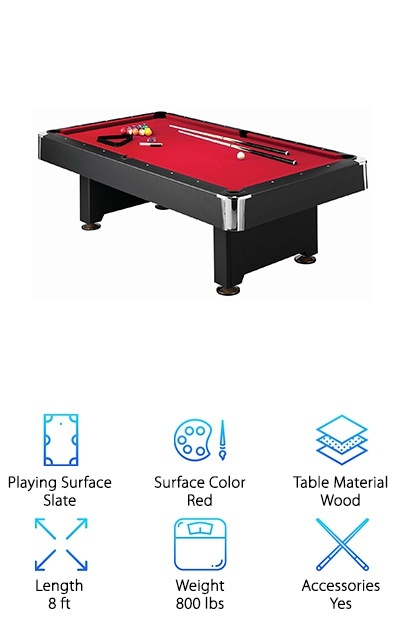 The Pockey 3-in-1 table is one of the most unique products we feature, and it is a must in your game room. 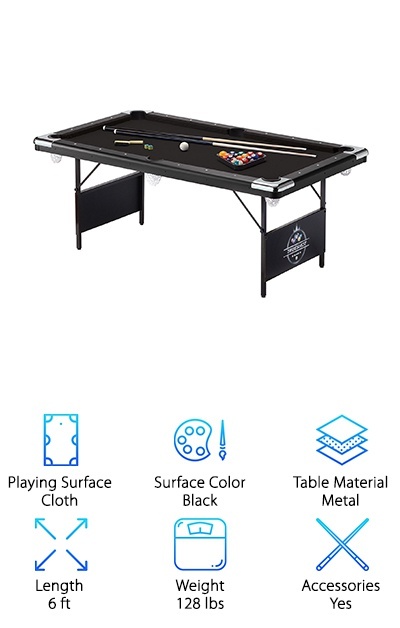 Here's the deal: Not only is this a quality pool table, it's an air hockey and table tennis set too! That's right, 3-in-1 means 3 sports in 1! Check out this ingenious creation. The table tennis surface is trifold for easy storage. Then the primary table surface flips over to either become a pool table or an air hockey "rink." Just like at the arcade, a blower creates the necessary air cushion for moving the puck. The accessories are included for all three games. For the billiards setup, you receive a brush, chalk, 2 cues, a set of balls and a triangle. Bottom line: This table has "winner" written all over it! Give the gift of fun and light-hearted competition. Give the Fat Cat Reno Pool Table, a favorite from our reviewers. Why? It features a time-honored design and beautiful detail. 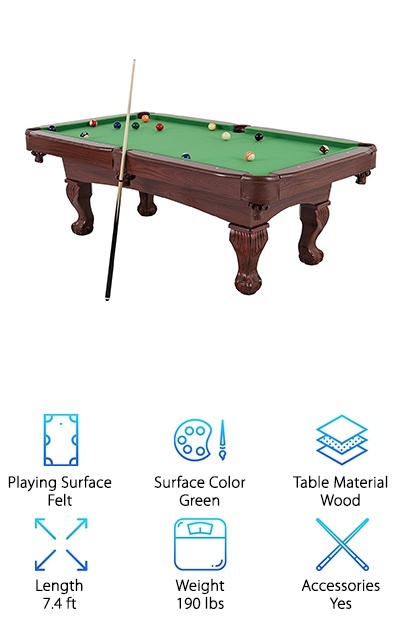 It’s also made from the best materials chosen by pool-playing professionals all over the world. Let’s start with the playing surface: The Accuslate surface is warrantied for 7 years. It's covered by a crimson wool cloth and surrounded by rubber bumpers and 6-inch rails. The pockets are done in the French style, and the table legs are beveled with a maple wood finish and a cherry veneer. This table is so sharp, it's going to make you wish you were wearing a crushed-velvet bathrobe and smoking from a pipe. Your buddies will be left in awe. They will also appreciate the included hardwood cues, the set of billiard balls and triangle and more. Your friends will be too busy admiring your style to beat you in a game. If little Johnny or Sally shows an interest in pool, you don’t need to rush them off to the closest bar. Bring the game home to them with the WGW Small Tabletop pool table set. A more affordable choice than the traditional full-size table, this billiards set is a breeze to set up and play on. It gets better: This table also makes the perfect gift. In addition to including the necessary cue sticks, ball set, and rack, you will also receive game play instructions. This table measures just over two and a half feet in length, so it can fit nearly anywhere. Stop eating dinner at the dining table and make it billiards central instead! It will be a bonding experience for you and your friends or your loved ones. One last thing: This table is recommended for ages three and up, so even the smallest members of the family can get some enjoyment out of it!